Potsdam 24.10.2018. M100 thanks Potsdam’s departing Lord Mayor Jann Jakobs for his continuous and persistent support of the M100 Sanssouci Colloquium as a highlight event of the city of Potsdam. As a founding member, Lord Mayor Jakobs played a major role in developing the M100 idea in 2005 and, as Chairman of the Advisory Board, he has been involved in the event’s development over the past 14 years. 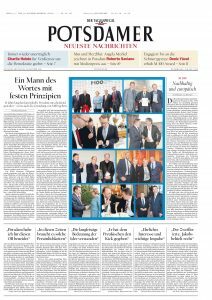 Today, M100 is one of the top-class platforms for quality journalism, democratic discourse and freedom of the press and opinion in Europe and has become an integral part of Potsdam’s calendar of events. During the advisory board meeting on 24 October, Mayor Jakobs was honoured for his services to M100 and received a farewell gift in the form of a cover page of the Potsdamer Neuesten Nachrichten produced for him, with which the advisory board honoured his services to M100. The large view of the title page can be found here.